Located just north of San Jose, less than two kilometers from the Mediterranean Sea, this rural complex, which includes two main single-story buildings, with wooden doors, also made of wood and large sills protruding from the windows, was used in the first sequence of “Fistful of Dollars” (1964) which was used to represent the farmhouse and small house used to hold Marisol (Marianne Koch). 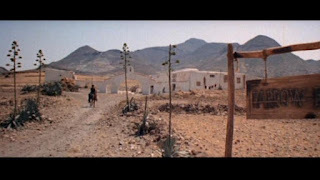 It then appears in “Bullets Don’t Argue” (1964) (for this film the cortijo is enriched with other structures: a wall with an arch joins the two main buildings and represents the entrance to the courtyard, in whose center is a fountain): “Johnny Yuma” (1966): “Day of Anger” (1967) (in which it represents Bill Farrell's ranch). 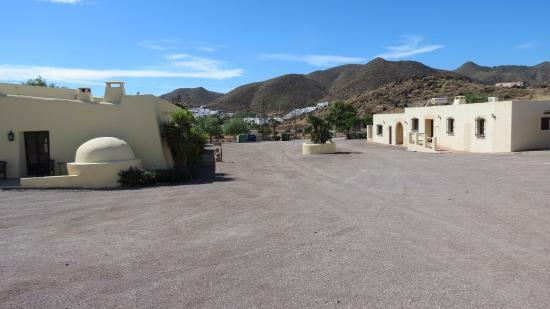 Realizing the great tourist development of the area (which today is part of the Cabo de Gata-Nujar Natural Park) in the 1990s, Cortijo El Sotillo was renovated and transformed into an equestrian club. Only the main building, which has become an elegant restaurant, has maintained its original forms: among other things, it preserves the typical domed oven leaning against the northern outer wall. As for this building, it maintains its original appearance a long rectangular room (and the first, entering, on the left, with the fireplace on the north wall), used as a set in "A Fistful of Dollars" to represent a kitchen in the sequence in which Clint Eastwood, after having slaughtered the thugs of the Rojos, frees Marisol. The building opposite, where, in the film, lived the husband and the son of the woman, has been completely renovated. The location is also used in "Day of Anger”, in the scene where Lee Van Cleef enters, finds a man hanged and is captured by bandits. The next sequence of this film, in which Lee Van Cleef is dragged by the bandits' horses around a characteristic "era" (a rotunda used for threshing grain, in the Andalusian countryside), which is also part of the Cortijo El Sotillo estate, and is just a short distance from the buildings themselves.